“I am not interested in mere representation of landscapes. Instead, I have been driven to capture the state of landscape where my personal emotions are projected. It still applies to the works I am currently working on. For me, the camera has been the best means through which I can express myself. 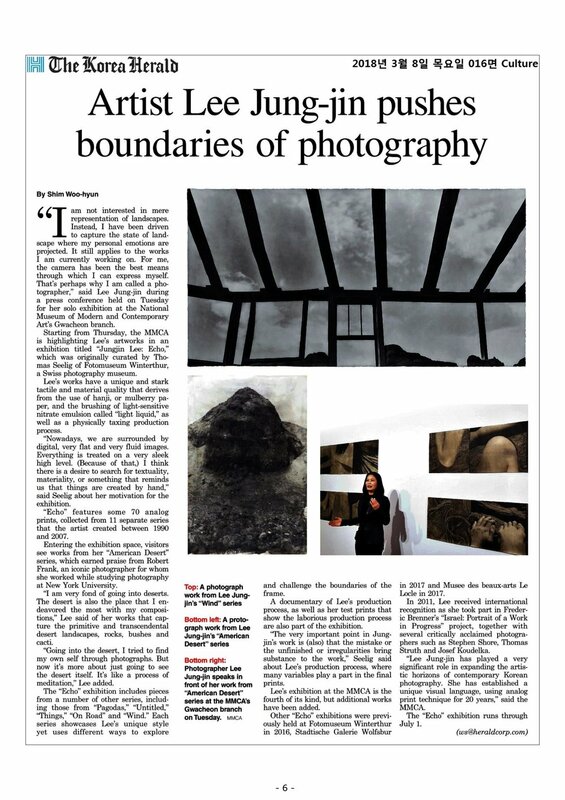 That’s perhaps why I am called a photographer,” said Lee Jung-jin during a press conference held on Tuesday for her solo exhibition at the National Museum of Modern and Contemporary Art’s Gwacheon branch. Starting from Thursday, the MMCA is highlighting Lee’s artworks in an exhibition titled “Jungjin Lee: Echo,” which was originally curated by Thomas Seelig of Fotomuseum Winterthur, a Swiss photography museum. Lee’s works have a unique and stark tactile and material quality that derives from the use of hanji, or mulberry paper, and the brushing of light-sensitive nitrate emulsion called “light liquid,” as well as a physically taxing production process. “Nowadays, we are surrounded by digital, very flat and very fluid images. Everything is treated on a very sleek high level. (Because of that,) I think there is a desire to search for textuality, materiality, or something that reminds us that things are created by hand,” said Seelig about her motivation for the exhibition. “Echo” features some 70 analog prints, collected from 11 separate series that the artist created between 1990 and 2007. 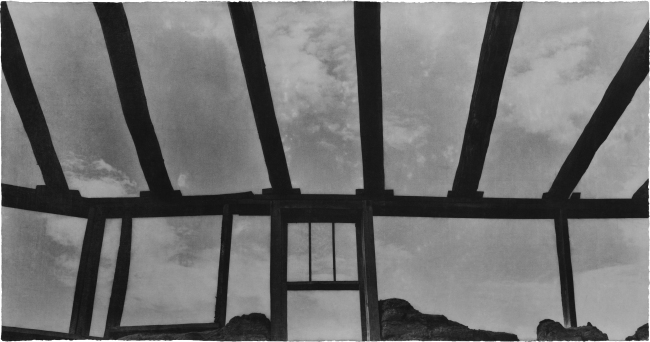 Entering the exhibition space, visitors see works from her “American Desert” series, which earned praise from Robert Frank, an iconic photographer for whom she worked while studying photography at New York University. “I am very fond of going into deserts. The desert is also the place that I endeavored the most with my compositions,” Lee said of her works that capture the primitive and transcendental desert landscapes, rocks, bushes and cacti. “Going into the desert, I tried to find my own self through photographs. But now it’s more about just going to see the desert itself. It’s like a process of meditation,” Lee added. The “Echo” exhibition includes pieces from a number of other series, including those from “Pagodas,” “Untitled,” “Things,” “On Road” and “Wind.” Each series showcases Lee’s unique style yet uses different ways to explore and challenge the boundaries of the frame. A documentary of Lee’s production process, as well as her test prints that show the laborious production process are also part of the exhibition. “The very important point in Jung-jin’s work is (also) that the mistake or the unfinished or irregularities bring substance to the work,” Seelig said about Lee’s production process, where many variables play a part in the final prints. Lee’s exhibition at the MMCA is the fourth of its kind, but additional works have been added. Other “Echo” exhibitions were previously held at Fotomuseum Winterthur in 2016, Stadtische Galerie Wolfsbur in 2017 and Musee des beaux-arts Le Locle in 2017. In 2011, Lee received international recognition as she took part in Frederic Brenner’s “Israel: Portrait of a Work in Progress” project, together with several critically acclaimed photographers such as Stephen Shore, Thomas Struth and Josef Koudelka. “Lee Jung-jin has played a very significant role in expanding the artistic horizons of contemporary Korean photography. She has established a unique visual language, using analog print technique for 20 years,” said the MMCA. The “Echo” exhibition runs through July 1.